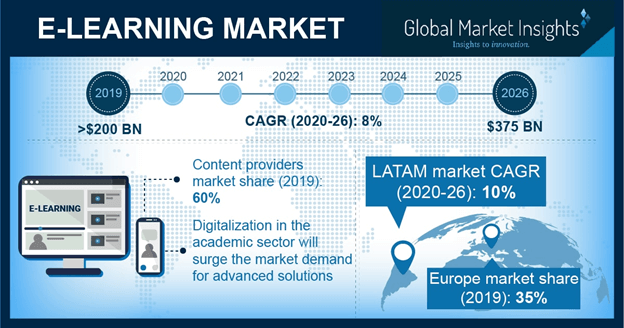 eLearning Market size is set to be over USD 300 billion by 2025; according to a new research report by Global Market Insights, Inc. The rise in the demand for cost-effective training and learning techniques in corporate and academic sectors will drive the eLearning market growth over the coming years. The increasing volume of course content makes it difficult for these sectors to manage and store such a large amount of data in their libraries or stores. The electronic medium of content delivery allows these sectors to store and manage their course or business information in online websites or application platforms. The rising adoption of cloud-based platforms in the eLearning market is providing these sectors flexibility in the content storage, accessibility, and processing. Some major advantages of the cloud learning platform include remote access, security, data backup, and cost-effectiveness. Moreover, the technology allows easy content delivery and access to students than depending on the books and course materials. The mobile learning technology is witnessing fast adoption in the eLearning market with the increased use of smartphones. Several application-based knowledge platforms are being developed that allow smartphone users to gain insights into any topic in real time. Some educational institutes and universities develop their own mobile-based applications that allow the students to login to the student portal and get access to the missed lectures. The major mobile applications being used in corporate sectors include Udemy, Skill Pill, DesignJot, and BoostHQ. Moreover, the developers in the market are also offering a game-based application platform that is used for teaching children with the help of interactive animated videos and pictures. These technologies allow schools to enhance the logical & reasoning skills and IQ of their students. Growing applications of technology in academic institutes is a major factor propelling the eLearning market. In 2018, academic sector is accounted for over 50% of the global industry share. With the increasing awareness about education and the adoption of modern solutions in several schools, universities, and colleges, the literacy rate is growing rapidly. Education centers are providing a digitized platform for learning and interaction to the students that offer deep and clear insights into academic courses, subjects, and topics. It allows teachers and guest lecturers to showcase the practical implications of the topic with the help of videos, pictures, and other interactive mediums. Moreover, the increased number of distance learning centers will drive the adoption of electronic education techniques, boosting the market growth. The North America eLearning market accounted for around 40% of the industry share and is growing rapidly due to the fast-technological adoption by several organizations to provide effective training to employees. The corporate sectors are engaged in enhancing their employee training programs that result in high employee productivity. The large organizations are incorporating software-based technologies to monitor and analyze the daily or weekly performance of their staff. However, small companies are finding it difficult to incorporate these high-cost solutions in their enterprises. Such factors have encouraged service providers to offer LMS hosted services to these SMBs. This is allowing companies to either host these solutions in their organizations’ servers or use Software as a Service (SaaS) hosting. Moreover, content developers in the region are offering training modules with a high degree of customization, engagement levels, and content quality, driving competition in the eLearning market. Key companies operating in the market include Aptara, Inc., Adobe Systems, Inc., Cornerstone, Citrix Education, Meridian Knowledge Solutions, Microsoft Corporation, SAP SE, NetDimensions., Oracle Corporation, Cisco Systems, Inc., Learning Pool, Apollo Education Group, CERTPOINT Systems, Inc., and Allen Interactions, Inc., among others. Players in the eLearning market are engaged in offering their content through the interactive medium that will develop a high interest of the learners in these training platforms. For instance, the companies are focused on the incorporation of AR & VR technologies in their content offerings. Skills2Learn Ltd. is providing such virtual reality simulation learning and training platforms for their learners.